The skin around your eyes is some of the most delicate and fragile tissue on your body. 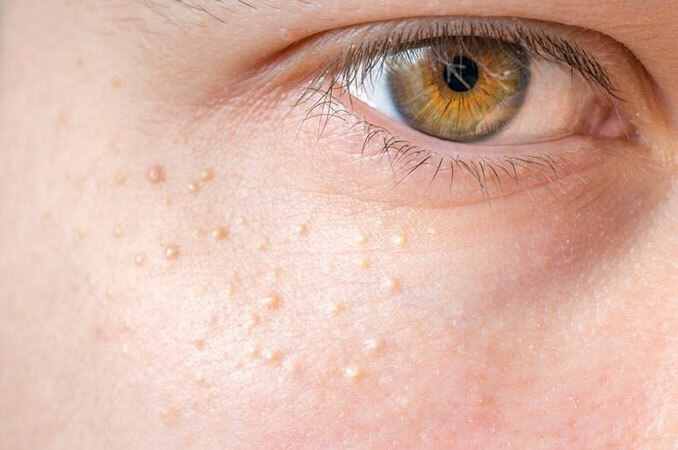 Thus, confusing milia – small bumps that are harmless but frustrating – with small whiteheads or pimples can get you into a heap of unattractive trouble. At worst, your well-meaning but destructive efforts may cause permanent blemishes or scarring. Unlike pimples, which are the combination of a clogged pore and mini-infection, catalyzed by specific bacteria colonies, milia are completely harmless. The small, hard, cyst-like bumps are typically found along the eyelid or lash line, but they can also erupt around the undereye areas, the cheeks, and the nose. The bumps are often thought to be small skin tags or miniature whiteheads. However, they can’t really be “popped” so the effort to do so results in skin irritation, inflammation and – if you aren’t careful – broken blood vessels or even scarring. Milia, also called milia cysts, are created by oil glands that didn’t develop properly. As a result, the dead skin cells (keratin proteins) that would normally be washed away via normal contact and your daily skincare routine become trapped inside the gland. To make things more complicated, there are also other, milia-like bumps that form depending on your skin type. The first is called syringomas, and these are caused by sweat duct tumors; the second is called xanthelasma, and these are caused by cholesterol deposits that form underneath the skin. Because the bumps look so similar, it’s best to consult with a licensed skin care professional who can determine which is which, as well as the best way to treat them. So, you just established you have milia and feel self-conscious. Thus, you work diligently with makeup products to hide them. Unfortunately, products such as eyeliners and undereye concealers, eye creams, and sunscreen, can actually make them worse. In fact, using the wrong skincare products and/or makeup is associated with the poor development of the oil gland that leads to milia in the first place. If that’s the case for you, not taking the right action could lead to even more milia than you already have. Here are some of the things you can do at home if you suspect you have milia. Unless you have ultra-dry skin by nature, you’re traveling to an exceptionally dry climate, or your skin care professional has given you the okay – avoid products that are heavier in texture or cream-based. These are known for clogging pores and also put a damper on your ability to exfoliate properly. Ironically, you may find your “dry skin” is actually dry because you over-moisturize, but that’s a whole other topic (read, Can You Moisturize too Much, for more about that…). Switching to skincare products that have a thinner formula is a good start. Also, verify with a skin care specialist to see if you’re skincare routine and the products you use are right for your face. Steaming your face at home can help to prevent milia and to prevent or help to treat clogged pores. The steaming process opens the pores and softens the skin, loosening and removing dead skin cells and trapped debris. Steaming is an inherent part of any facial so the presence of milia may be the perfect excuse to treat yourself to a facial at a local spa. Note: be careful as hot steam can also burn or irritate skin. Read, How to Do a Steam Facial at Home, for safe instructions for healthy steaming. Be aware, though, that steam does not treat existing milia. For that, you need to have the trapped oil delicately extracted by an aesthetician. The combination of professional extraction, paired with amended skin care will make your milia completely disappear. A licensed aesthetician or dermatologist is your final line of defense if home remedies and self-care aren’t working. If milia persist, especially if they are on your lash line and/or eyelids, professionals have specialized tools to extract their contents, which can speed the healing process. Again, you should never do these extractions on your own without risking a bigger, more permanent skin issue. Other treatments are also possible, including topical medications, skin peels or laser treatments. Chronic milia may be a sign of an underlying condition, which can be identified by professionals and treated accordingly. Are you baffled by the persistent bumps appearing on your face? Schedule a consultation with the experienced aestheticians here at Skin Deep. We’ll determine which bumps are which and work with you to develop a personalized skin care plan that eliminates them once and for all. next post: Women Shaving Face: Does Shaving Make You Look Younger?